Looking for reduced maintenance and better reliability? Upgrade your packaging line with the Wulftec WCRT-175. If you’re hand wrapping more than 15 loads per day, an automatic stretch wrapper can help dramatically reduce your film and labor costs. 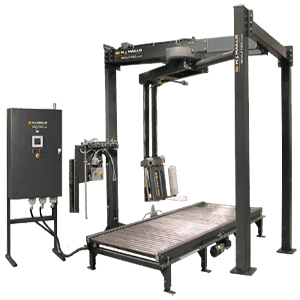 This conveyorized, rotary arm model keeps pallets stationary throughout the wrapping process, so you never have to worry about items falling off or becoming damaged. Additional performance features include an Allen-Bradley CompactLogix L16ER PLC with integrated Ethernet port, photoeyes to monitor access points and wrap over clamps to secure the stretch wrap tail. To learn more about the Wulftec WCRT-175 Conveyorized Automatic Rotary Arm Stretch Wrapper, give us a call at (609) 337-3641 or request a quote online. The factory certified support technicians at Hughes Enterprises are available 24/7 to respond to your packaging equipment maintenance requests. Whenever downtime strikes, you can give us a call and a service technician will be on-site within hours to address your needs.